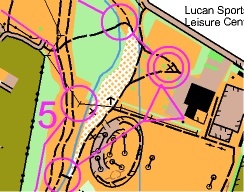 Permanent Orienteering Courses at Griffeen Park; Ticknock; & Phoenix Park. See Griffeen location map here. If you’d like to check that you got them all right, e-mail 3rockoc@gmail.com and we’ll send you a sheet with the correct codes on it. See the Ticknock/Three Rock Wood location map here. The Phoenix Park Visitor Centre at Ashtown Castle has a permanent orienteering course which you can download here. See the location map here.